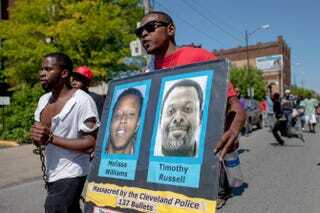 People march in protest May 23, 2015, to the Cuddell Recreation Center in Cleveland, where 12-year-old Tamir Rice was killed by police. The march was in reaction to Cleveland Police Officer Michael Brelo’s acquittal on manslaughter charges in a separate case in which he shot two people in a fatal 2012 incident during which police officers fired some 137 shots at the pair. Updated Tuesday, May 26, 5:45 p.m. EDT: Specifics of the agreement between the Department of Justice and the city of Cleveland over abusive and excessive use of force by police have been released, according to Yahoo News, and they include a substantial overhaul of police procedures and policies. An independent monitor will oversee changes in the Cleveland Police Department, which include community policing and getting officers more involved in their neighborhoods; modernizing technology; training to avoid racial stereotyping; and implementing new procedures to investigate misconduct allegations. According to the website, Mayor Frank Johnson says that he hopes the agreement will be a model for other cities. Groups, including the NAACP and the police union, are still reviewing its details. The Justice Department has reached a settlement with the city of Cleveland after an 18-month investigation into the city's Police Department found "a pattern of unconstitutional policing and excessive use of force," the New York Times reports. According to the Times, specifics of the settlement have not been disclosed, but the investigation, which ended in December 2013, was prompted after a 2012 shooting involving several officers who fired more than 130 shots at two unarmed people—Timothy Russell and Malissa Williams—inside a vehicle. News of the settlement comes just days after Cleveland Police Officer Michael Brelo was acquitted for his role in the 2012 shooting. The Times notes that while several officers fired some 137 shots into the vehicle after a high-speed car chase, Brelo was charged with manslaughter for reportedly waiting until the car came to a stop and then jumping onto the hood and firing another 15 shots into the car's windshield. Both Russell and Williams died from gunshot wounds. Some 71 demonstrators were arrested after hundreds of people gathered Saturday to protest the officer's acquittal. According to the Times, the most damning portion of the Justice Department's investigation cited several incidents during which officers used excessive or deadly force. "Investigators said officers unnecessarily used deadly force; used excessive force against mentally ill people; and inappropriately resorted to stun guns, chemical sprays and punches," the Times reports. The investigation was concluded before the death of 12-year-old Tamir Rice, who was fatally shot by police while he played with a toy gun in a Cleveland park near his home. The Times notes, "The Justice Department has opened nearly two dozen investigations into police departments under the Obama administration. Federal investigators found patterns of unconstitutional policing in cities including Seattle, Newark, Albuquerque and Ferguson." An investigation has been launched in Baltimore in the wake of the death of 25-year-old Freddie Gray, who died from injuries suffered while in police custody.